Strangely, I missed seeing this at WUWT so I figured you might have missed it too. 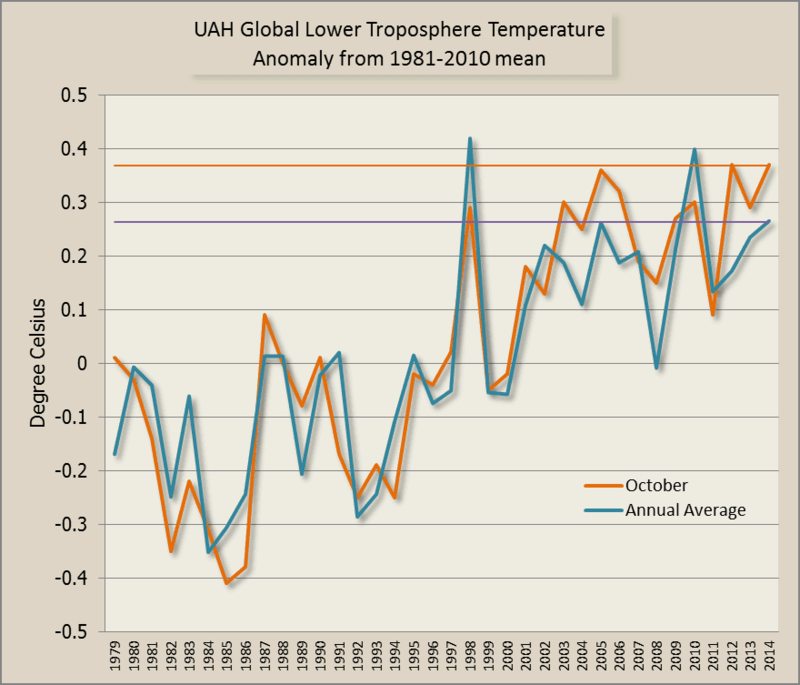 It's the UAH update for October - the temperature of the lower troposphere. 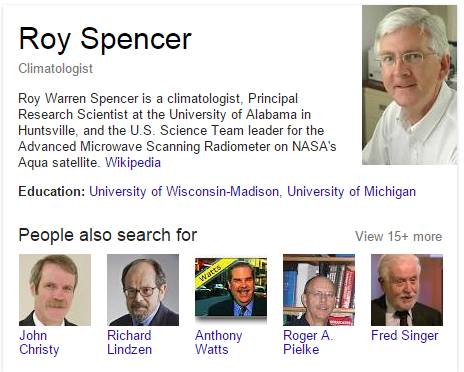 Roy Spencer reported it a few days ago but the data has only just now been uploaded. Anthony Watts must have overlooked it for some reason. I've plotted the October anomaly (October only for each year) as well as the annual average anomaly. I've added lines for the latest data so you can compare it with past years. Click the chart to view a larger version. This October was equal hottest in the UAH record, with 2012. As for the annual average, it's shaping up to be the third hottest in the UAH record, after 1998 and 2010. I just noticed this curiosity when I googled for Roy Spencer's article. Notice the grouping. What a disreputable lot. Steve McIntyre, Phil Jones, Mark Steyn, Gavin Schmidt, Anthony Watts. If it is only going to be third highest year, then the pause lives on! long live the pause! Hip hip hooray!!! Also you DO know that Spencer and Christie get money from the government. Their jobs DEPEND on giving the government the results it wants! Is there a correlation between the super El Niño of 1997 and the extreme warmth of 1998? Hmmm. Someone should model it, so we can be 97% certain they’re linked. Hmm ... 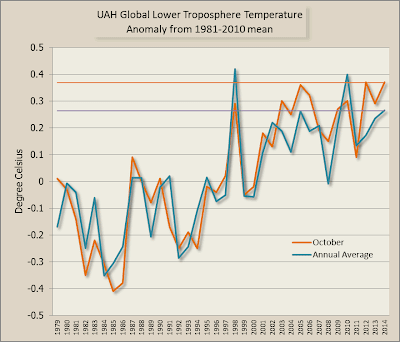 I have to squint to see it, but isn't the Oct. 1998 UAH anomaly a wee smidge below Oct. 2014? Naw, can't be, my eyes must be fooling me. I am historically one from the other team, but I have to admit that the UAH temperature record presented for Octobers does show some sort of shift after about 2003. There is certainly no cosmic explanation for this.